Valor’s Vigil is the exciting and suspenseful special addition to the Virtues and Valor series by selling inspirational novelist, Hallee Bridgeman. An American spy undercover in a Nazi uniform operating under the codename VALOR, Leopold Schäfer is in charge of the prisoners in Occupied France’s Valeurville prison. In the wake of Marie Perrin, codename TEMPERANCE’S arrest, Leo must handle the situation with the utmost caution. Can he protect her without blowing his own cover, or will he place his own life in danger to keep her safe? LEOPOLD SCHäFER, the only child of Major Charlene Radden and former spy, Karl Schäfer has trained his enter life for this moment in time. 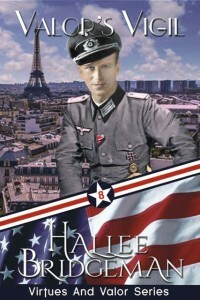 An American spy undercover in a Nazi uniform operating under the codename VALOR, he receives a promotion to Oberleutnant and a new duty assignment in charge of the prisoners in Occupied France’s Valeurville prison. In the wake of Marie Perrin, codename Temperance’s arrest, Leo must handle the situation with the utmost caution. On one hand, every instinct in his heroic mind screams to protect the beautiful wireless operator from the hands of the Nazis. On the other, he cannot risk compromising his cover. It takes quick thinking and not a small amount of prayer to shield her from the harsh interrogation tactics of the Schutzstaffel trained interrogator. While he personally sees to her health and safety, he realizes that more than his cover is at risk as his feelings for the beautiful spy grow. As her situation grows more grave, he must focus on the bigger picture and the whole mission and make the hardest decision of his life. Can he protect her without blowing his own cover, or will he place his own life in danger to keep her safe? VALOR’S VIGIL is part eight of eight serialized novellas entitled the Virtues and Valor series. The special edition to the Virtues and Valor series by Hallee Bridgeman. Eight serialized novellas, each inspired by real people and actual events, reveal the incredible story of amazing heroines facing the ultimate test of bravery. Leo shifted gears in the Kübelwagen and slowed the vehicle to go around the curve on the country road. As he drove with the top down, he enjoyed the warm French spring air versus the recent bitter Munich winter he’d endured. The breeze on his face as he drove made him miss his 1938 Opel Admiral convertible — the college graduation present from his parents. Nothing about the boxy Kübelwagen handled like his sleek Opel, and he looked forward to getting behind her wheel again one day. Pulling his mind from the nostalgia of his home in Oregon, he brought himself to the present day. Rumor had it, his commander planned to promote Oberleutenant Beck to Kapitan and transfer him to the prisoner of war camp currently under construction several miles from town. With Leo’s recent rise to Oberleutenant, he knew he would receive a orders to take over Beck’s position as officer charge of the prisoners in the Valeurville prison. In that position, he could help facilitate the passing of information from headquarters to the housed prisoners, insuring the planned escape happened more smoothly. Everything he did, though, had to be completely above board and appear harmless, or else his cover would be jeopardized. If his cover became jeopardized, so would his father’s. As he rounded another corner, he saw a woman on a bicycle. Even from this distance and behind her, he recognized Marie, aka Temperance. He remembered from a briefing long ago that a farmer in this area was friendly to the Resistance. She likely had just used his farm to send a wireless message — which meant that she probably carried her wireless machine in the basket strapped to the back of her bike. He’d met her face-to-face once before, when he’d rigged his uniform pants to lose a button right before his promotion ceremony. It gave him access to her room — she couldn’t very well sew a button on his pants while he still wore them, unlike a uniform coat — and he was able to inspect her living quarters and make sure nothing appeared out of order to a watchful eye. It had struck him then, as it did now, how drawn he’d felt to her since seeing her photograph in her dossier months ago in a hangar in Britain. He had two choices. He could drive right by her. Or, he could give her a training opportunity. Let her speak to a German officer and work on traveling with such contraband on her person without giving anything away. “She is from America, like me,” he proclaimed, as if giving her information she didn’t already know. He hated acting like a racist. He personally believed that man originated from one person – Adam – and that race had nothing to do with anything about a person’s character. However, while under cover in this Nazi uniform, he must do nothing to rouse suspicion. Even if that generated the look of disgust that crossed her face. He got back into his Kübelwagen and started the engine. Without looking back at her, he headed on his way. As he drove, he felt his face frown, thinking of the inappropriate timing for his pursuit of her attention. What had possessed him to do that? Yes, she was beautiful. Yes, he felt like he could talk to her for hours. But, honestly, couldn’t he have waited until this war ended? Frustrated with himself, he clumsily ground the gears in his vehicle as he went around a corner. Maybe he could come up with a way to gracefully back out of his invitation. Especially before his mother or father got wind of it. This entry was posted in 8. Valor's Vigil, Blog, Virtues and Valor Series and tagged release day, valor's vigil, virtues and valor series. Bookmark the permalink.